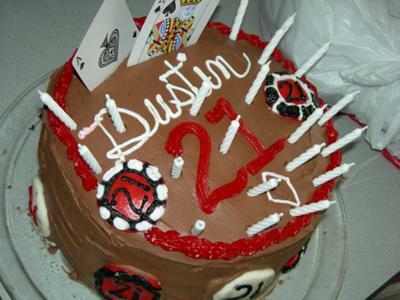 To make this lucky 21 poker cake, I made the cake from scratch, using a family recipe. I made 3 round layers, frosted in between each one. I then made some fondant so I could shape them into casino chips. I made frosting to decorate the chips and also write on the cake. I used some playing cards we had to add a bit of casino touch. This cake was for my neighbor Dustin, who turned 21 on July 2nd. He and his parents went on a trip with us to Las Vegas on July 7th, and I thought a 21 themed cake was appropriate. The cake and frosting were made from scratch, along with the decorations, everything was edible except the playing cards!